Author: Terry Peterman Thousands of people enjoy the ownership and the use of recreational vehicles; from small affordable tent trailers or compact travel trailers, to large motorhomes for the luxury camping experience in high end R.V. resorts and suitable for a full-time nomadic lifestyle. When you are parked in most RV parks or campgrounds, power is usually available to plug in the RVs to the appropriate outlet to provide power to charge the batteries, and to run the not so essential appliances such as televisions, toasters, and to power our computers, hairdryers, coffee makers, and even air-conditioners. The problem comes when the unit is not in use, and is parked and put away ready for the next opportunity to get out and enjoy the RV lifestyle. Some are parked away in storage facilities which may or may not offer power to keep the unit plugged in. Some people are fortunate to have the room and are allowed to park their units near their home on their own property. It is a good idea to keep the unit plugged into power when not in use, especially in colder climates where a discharged battery or batteries can be destroyed by freezing temperatures. In most cases a 15A, 125V circuit is enough to provide the basic power required keeping the batteries charged up but when you want to prepare the unit for a trip, it’s nice to have full use of all the on-board appliances such as the furnace, refrigerator, and possibly the air conditioner. This is when you need to have the proper connection for full, or at least partial use of all the on-board conveniences. Many of the large units now need a 50A, 125/250V connection for the full electrical service to the unit, but the majority of your RVs need a 30A, 125V supply. Even the larger units will have the option to run on 30A where 50A is not available. 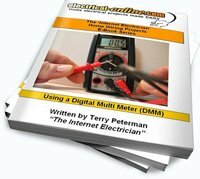 In this post (which includes a step-by-step video and full article), I am going to guide you through the installation of a dedicated, 30A, 125V R.V. receptacle so that you may have the luxury of being able to provide power to your stored RV when parked, hopefully in a location close enough to the unit to avoid the use of extension cords. In this situation I am using my electrical demonstration wall located inside my attached garage to complete the project. This location will work for me when I have my motorhome here at our house as we prepare to move in or out of the unit as required. I can park out front of the house and the power supply cable will reach this outlet quite comfortably. 1. The correct manufacturer, size, and style of the required 30A, single pole breaker. 2. A sufficient length of cable, and the appropriate type of cable for your particular installation. In my case here, standard NMD-90 cable will work, and #10/2 will be what is needed. 4. An RV receptacle. In this situation, a flush mount 30A, 125V, (NEMA TT or RV-30R). 7. Cable staples or straps, screws, etc. 8. The standard set of electrician’s tools, screwdrivers, wire-strippers, hammer, electrical meter, personal protective equipment, etc. 1. Once the box location is determined, and you’ve found a path to get your cable to the panel, the first step is to run the cable and mount the box. In my situation I am showing a fairly typical situation of an installation that may occur on a plywood covered wall inside a garage. The plywood will be screwed or nailed on to the wall studs so it can be removed where needed in order to run the cable through the walls to the panel location. I am bringing the cable in to the back of the box so that no cable is exposed on the wall surface thus requiring mechanical protection, or cable suitable for surface installation in a dry location such as BX or armoured cable. 2. Run the cable through the wall studs behind the plywood to the panel location. 3. Mount the box so that a hole can be drilled in to the plywood between studs, but close enough to a stud to allow wood screws to secure the box firmly to the wall. The hole will need to be large enough to accommodate the cable connector when installed. Strip the appropriate amount of the cable jacket (6- 8”) and insert the cable into the back of the box though the connector and tighten the lock nut and the connector screws. Ensure you tighten the cable connector down on the external jacket and not on the wires. Then put the box in place and secure to the wall with wood screws. 4. Wrap the bare ground wire clockwise around the box ground screw 180 degrees and tighten the screw. Leave the cable long enough length beyond the grounding screw so the wire can reach the ground terminal on the receptacle and tighten firmly. Strip ¾” of insulation from the neutral (white) and the hot (black) conductors and insert them in the identified terminals on the receptacle and tighten the terminal screws on each terminal. 5. Now mount the receptacle to the cover plate with the machine screws provided and then mount the plate to the box. Take care not to pinch the wires between the plate and the box when pushing the excess wire in to the box. 6. At the panel, pick a knock-out that is easy to work with to allow the cable to enter the panel. With the main breaker, or the breaker that feeds the sub-panel off, and checked that it is off with your electrical meter, mount the cable connector into the knock-out. Strip enough cable jacket so that you have plenty of wire length to reach the farthest corner of the panel. Then insert your cable and tighten the cable connector, again ensuring that it tightens down of the jacket of the cable and not on the exposed individual conductors. 7. Now connect the bare ground wire to an available ground lug mounted to the panel tub in the back of the panel. 8. Next connect the neutral conductor to the neutral buss bar in the panel. 9. Then mount the breaker in the next available spot in the panel and push firmly in place. Then connect the black wire to the breaker terminal. 10. Remove the appropriate breaker knock-out in the panel cover to accommodate the new breaker position. 11. Install the panel cover. It’s a good idea to shut off each individual breaker in the panel before turning the main feed breaker back on. Then turn on each breaker one at a time, including the newly installed circuit breaker. 12. Now test your work. Using your meter, and setting it to the appropriate AC voltage scale, insert one meter lead into the hot and the other lead into the neutral slot of the receptacle. You should get somewhere around 120V. Then check from the hot slot to the ground terminal. Again you should read somewhere around 120V. Now check from neutral to ground. The reading should 0 volts. 13. You are now ready to plug in your RV and test the electrical components of the RV for proper operation. Having a proper outlet to plug in your RV while storing it at home, or while preparing the unit for the next camping trip will help eliminate a lot of frustrating problems that can occur due to dead batteries, and it will be very convenient to have everything in working order prior to hitting the open road for your next RV adventure. This entry was posted in How-To-Videos, Outdoor, Receptacles and tagged 125V, 30A, cable, circuit, circuit breaker, electrical panel, outlet, panel, receptacle, RV, RV outlet, RV receptacle. Bookmark the permalink.